Purposely combining organizational models creates an ambidextrous operating system. This allows companies to function efficiently enough to reach the full potential of their current operations, while also benefiting from the flexibility required to react to market forces and enter new areas of business. Process or employee centric? Efficiency or agility focused? Blue World or Pink World? Above all, this all-encompassing digitalization creates brand new business models, and speeds up change even further. A company’s ability to survive increasingly depends on how quickly it can react to trends. The most crucial factors for success are agility and innovation. But how can a company guarantee them? As market structures change and our way of life is transformed, a company’s organizational structure must keep pace. The good news: The operating system update is available now. The bad news: Clicking “install” is not enough. It’s not that easy to implement, because agility cannot be a top-down policy. We’ve developed the Haufe Quadrant to guide companies in terms of their organizational design. 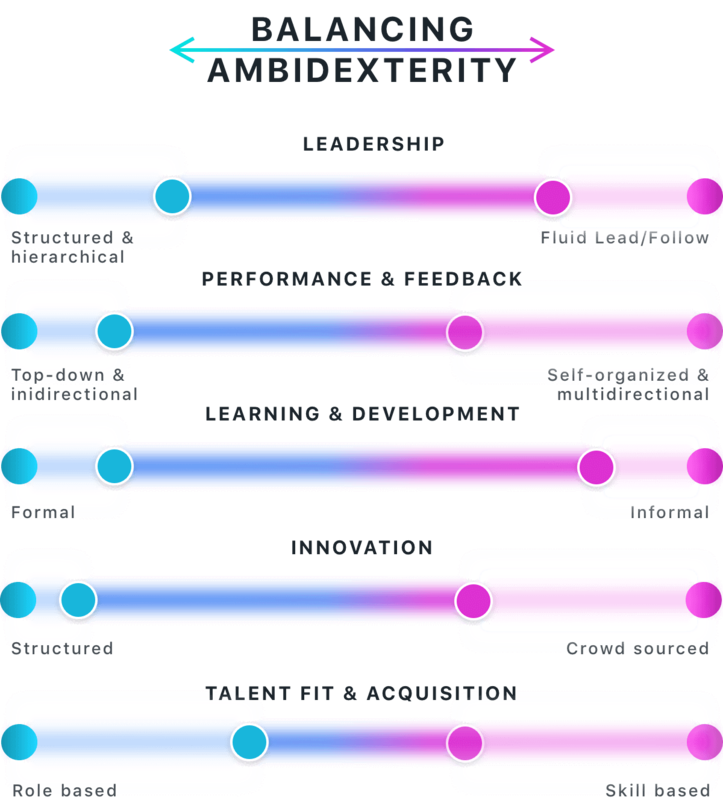 This model is intended to help companies develop their organization in a way that prepares them to face the future effectively and flexibly. Why go from blue to pink? 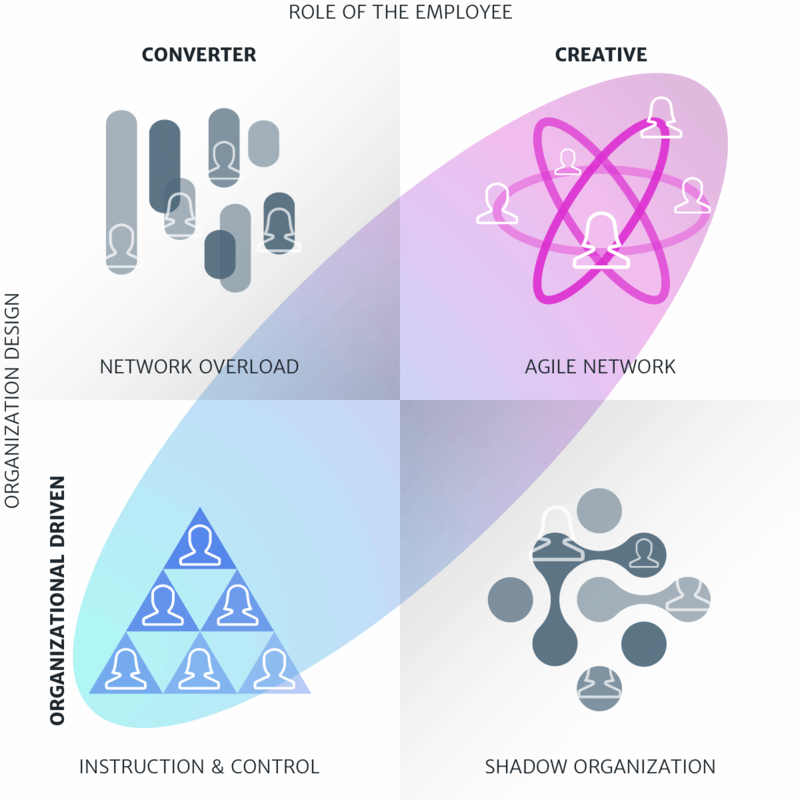 The Haufe Quadrant depicts two axes: The X-axis evaluates the roles of individual employees: Are they implementers or creators? And organizational design runs along the Y-axis: Do the teams work independently, or are they managed? Combining these two parameters creates different forms of organization, which may be more or less appropriate for each situation. Forms of organization which are based on the principle of “instruction and control” proved reliable in the last century. Their strategies, processes, and solutions are set up to work with a classic, top-down structure with clear instructions and strong leadership. We call this the “blue world”. Its opposite is the “pink world”, which operates with agile networks that give employees the freedom they need to create and draw on their self-direction. Today, most organizations already have teams who make decisions and carry their projects forward autonomously. Either officially, or – if the organizational design does not permit it – as a shadow organization. The “blue” system's clear hierarchy, led by a strong leadership figure, guaranteed high efficiency for a long time. However, this model is slow and rarely leads to innovation. Who knows how many billion-dollar-ideas have languished in the shadows of these hierarchies, never to see the light of day? There’s no way around it: companies who want to survive in the long term in a dynamic market environment must update their operating system. This new operating system must also provide the processes and tools needed to support agile networks. How agile is your company culture? Your current quadrant position has a big impact on the future development of your company. In fact, a company is not a point in the quadrant but rather an ellipsis. This means that all the different forms can surface in different ways: some departments work well with instructions and management, while other teams find success as agile networks. What does this mean for you? If some of your departments still play by the rules of the old, “blue world”, don't worry. There has to be a balance. In the medium-term, your company’s success depends increasingly on building a “pink world” into your organizational design. With the “Path-to-Pink Configurator”, we provide you with the tool with which to evaluate your company’s maturity. Are you ready for the future, or are you still trapped in a rigidly traditional structure? Determine your current status quo in the five areas of Leadership, Performance & Feedback, Learning & Development, Innovation, Talent Fit & Acquisition and establish quantitative goals. After the self-assessment, you’ll know where you stand on the road towards a new work culture. As for the next steps? We’ll be glad to help, since working towards the future is part of our history! With Rhythmix, we’ve developed a process that uses gameification to help you identify your biggest pain points and challenges. We do this using the Eigenland method, whose graphics allow you to visualize the aspects you want to (and should) change. Then, through Lego Serious Play, we develop a tangible vision that vividly demonstrates the goal at all times and serves as a reference point. Finally, the Metro Map visualizes the process you want to establish, and shows everyone a legible path forward to “New World”. Once you have a clear vision, it’s time to implement it. Above all, that means change. Possibly even transformation. But in any case, a shift. This is only possible if all employees work together, meaning that employees have to drive the change themselves, because they agree with it, and value it. And because they see and understand how it benefits them. They need ambassadors who bring the topics to life and who inspire others by setting an example. Or infect them. Because ideally, transformation spreads through an organization like a virus – except the effects are only positive. To achieve this, each employee must find their own purpose in it all. We call this the PersonalWHY. Employees balance this purpose in discussions with colleagues and management with the company’s vision and mission – also known as the CompanyWHY. This results in a so-called SharedWHY, which is the intersection between the company’s goals and personal goals. This SharedWHY drives employees to commit to the company – and give it their all. It also allows them to face change head-on, propelled by their own values. And infect others. Until in the end, everybody is fully committed tothe transformation. That’s why we call it WHYral Transformation.